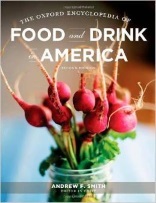 For more about the book, visit the Paris Food History site. Chez Jim is Jim Chevallier's Web site. If it is difficult to define, well so, say some, is Jim. The two largest groups of visitors to this site have typically come for the free original monologues and the film finance information. More recently, many have been drawn by information about the origin of the baguette, (one of the first of an increasing number of items here about bread and baking). Some are also drawn by bits of information on figures such as Tim Leary, the Beatniks and Louise Nevelson. But since its earliest incarnation in 1996, the site has also included genealogy information, looks at Paris and samples of fiction and poetry. In subsequent years, it has grown to reflect new interests, including self-publication of several books, further travel (cross-country, up to Northern California and to Saigon, among other places) and the 18th century in France (including information on the Bastille and a number of 18th century recipes). Where did the CROISSANT come from? For more about the book and August Zang, click HERE. Visiting the Culinary Historians of San Diego... - With a talk on January 19 at the San Diego library on Dining Out in Paris Before Restaurants". Not merely a book about the history of food in Paris - A very nice review for the new book: "This is not merely a book about the history of food in Paris. 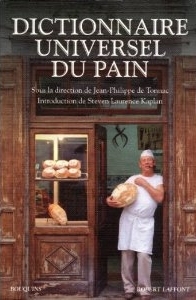 It is also covers the history of writing about the food of Paris. [Chevallier] masterfully procures for the reader a condensed history of Paris, spanning from the time of the Neanderthals to the modern day; considering this scope, his approach is neither dry nor tedious but surprisingly concise..." Visit the book's Amazon page for the rest. Coming September 24 at Los Angeles' The Last Bookstore - Jim Chevallier speaks on "Dining Out Before the Restaurant". Visit Eventbrite for the details. A History of the Food of Paris is now out! 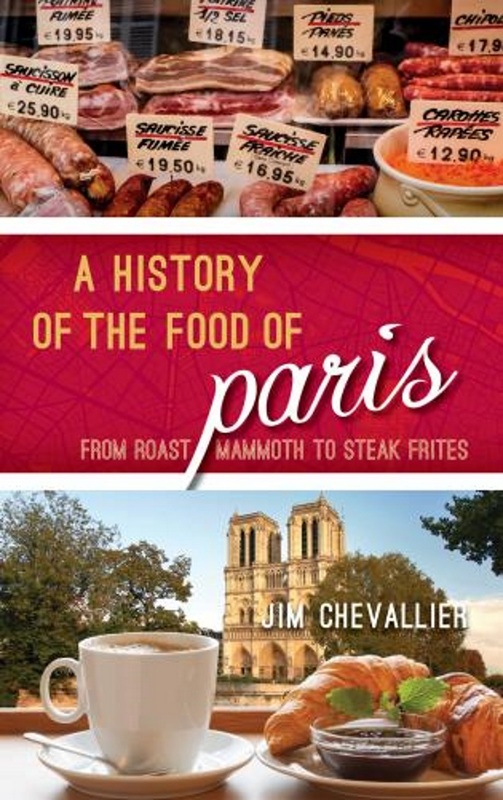 The first comprehensive history of the food of Paris is now available! See the main site for more information and a discount code. And in related news, on June 16, the Culinary Historians of Southern California will present a talk by Jim Chevallier on "Dining Out Before Restaurants Existed" at the Pacific Palisades library. Florida's ACTeen performs monologues from Bullies On May 11, 2018, teens from the Amelia Community Theater's ACTeen program gave a staged reading of monologues from Jim Chevallier's Bullies: Monologues on Bullying for Teens and Adults. Supporting A History of the Food of Paris A new blog - Paris Food History -, starting with a post on how tipping came to restaurants, and (of course) a Facebook page. And the main site for the book now includes a page of videos related to Paris history, markets and restaurants. "Modernist Bread" hits the shelves This monumental project FINALLY made it out the door (and through this contributor's) and has been getting widespread media coverage ever since. "The Great Medieval Water Myth" cited Do YOU think medieval drinkers drank beer and wine to avoid bad water? Back in 2013, I demonstrated that this was the Great Medieval Water Myth. A few months later the post went viral and has remained popular since. Now it's been cited (for the first time?) in print (in Pete Brown's Miracle Brew): "But in 2013 food history blogger Jim Chevallier challenged this, presenting numerous references to water being drunk as a matter of course from Greek and Roman times, through the ages of the Franks and Gauls to classical France and Italy." Two book projects and Le Figaro The manuscript for one book is about to go into production; another (Modernist Bread) is now slated to appear in November. Meanwhile, an article in the Figaro has just cited August Zang and the French Croissant: How Viennoiserie Came to France in an article. 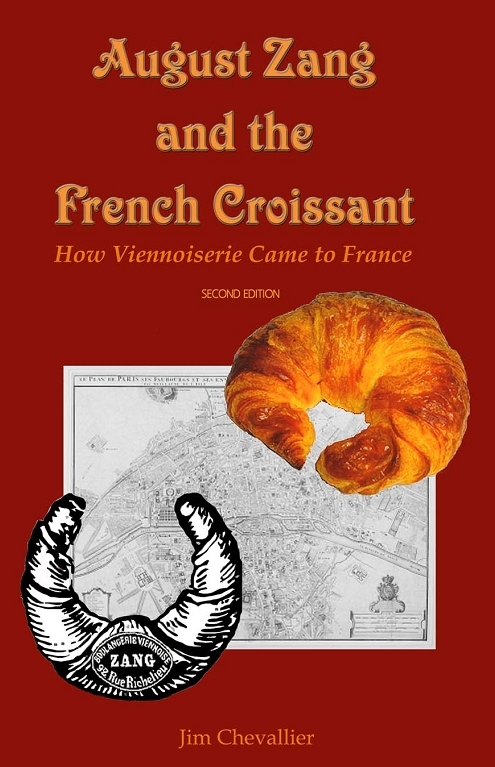 This modest little self-published book has become the standard reference for croissant history. Ah Paris....Where I always see old friends (two of whom took me to their country house by Aix), but also went this time to do research for my book. Ate in all kinds of restaurants, photographed all kinds of food. Now that I've researched the city, many streets have multiple layers for me, stretching back to Roman times. Just back from Cuba! Where a bread historian naturally enough would go to study bread, bakers and bakeries in Havana. For some glimpses of the trip, see this video and the photo montages here. See it now, before the first Starbucks. Modernist Bread is now available for pre-order: "Although Modernist Bread will now be arriving on shelves in May 2017�later than we originally anticipated�it will be gorgeously illustrated, including modern scientific research and rigorously tested techniques and recipes. We have collaborated and consulted with 75 industry leaders around the world, including historians Jim Chevallier and....". Savoring Gotham: A Food Lover's Companion to New York City, just published, includes two contributions by Jim Chevallier. Cited in the French newspaper Lib�ration:"It is starting in 1920, according to the writer Jim Chevallier, that our first baguettes appear, the very image of the purity of flour.� La victoire cro�te que cro�te. Is the Croissant Really French? : A brief history of the croissant � from kipfel to Cronut. Hold Chez Jim in your hand! 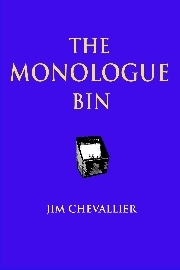 For several years now, most books from Chez Jim Books have only been available as ebooks. But here's a surprise: people are buying print books again! And so for the first time a number of Chez Jim books are available in print: original works like Paris Poems, Bullies: Monologues on Bullying for Teens and Adults, and About the Baguette: Exploring the Origin of a French National Icon and translations such as A Tour of Two Cities: Eighteenth century London and Paris compared and How to Cook an Early French Peacock: De Observatione Ciborum, as well as a number of extracts from Le Grand d'Aussy's work - The Well-Set Table in France: Furniture and Settings for Meals from the Gauls to the Eighteenth Century, Eggs, Cheese and Butter in Old Regime France, Catholic Fasting in France: From the Franks to the Eighteenth Century and Feasts and All Their Finery: Elegant Dining in Old Regime France. Sort of a food history blog When you're writing two books - one on early medieval food, the other on the history of French bread -, you get a lot of leftover tidbits you'd like to share. So why not put them in a blog? Say, a blog called Les Leftovers: sort of a food history blog"
Subjects so far have included aqueducts under the Franks, a soup served to Gregory de Tours, snails found in tombs, shifts in French bread and the evolution of courses in early French table service. So if this is the kind of thing that interests you, come take a look. 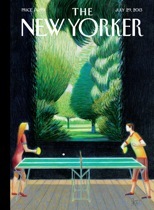 Quoted in the New Yorker! In Bill Buford's Notes of a Gastronome "Cooking With Daniel" in the July 29th New Yorker one finds the following quote "The food historian Jim Chevallier points out that the word 'Vegetarian' didn't exist yet." A brief, but flattering, mention. Coffee came to France in 1638. And then? Essentially, it disappeared. Le Grand's tale of how it reappeared - more than once - before finally taking hold as one of France's favorite drinks is only part of what he discusses in a long section on non-alcoholic drinks in France. Before sodas and milkshakes came lemonade and rissolis, and other drinks long forgotten today. 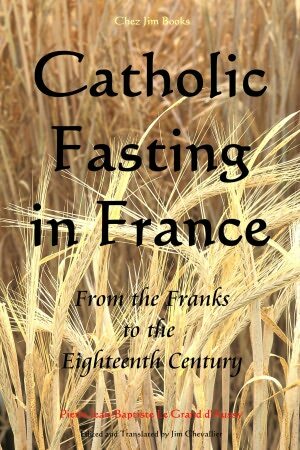 This new translation gives English speakers a chance to read one of the classic accounts of how all these drinks took hold in France. What was the first true American bread? How did American bread get to be so bad? What does 'biscuit' mean? 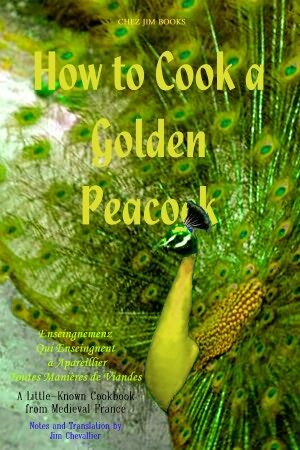 Have you ever wanted to gild a peacock? What was REAL medieval food like? A woman who killed three men in a sword fight; drunken musketeers assaulting passers-by; a wife whose husband brought his mistress home and beat her when she objected.... More colorful characters and dramatic vignettes from Old Regime France. France was barely born when a Greek doctor wrote a Frankish king a letter, telling him what to eat. A letter in Latin. Or visit this page for some samples. Love the history of wine? See TV Type Scenes for more. Samples from BULLIES - a new monologues series for teens and adults - are now up.